Today we wanted to give you all a brief tutorial on creating a decorative edge on the old fashioned butcher block counters. It's a quick, cheap, and easy way to spruce up your project, and it's something you can do yourself without much difficulty. If this is your first time on the site, be sure to check out the whole kitchen reveal, including our butcher block installation throughout our kitchen. Thanks to a few of our blog commenters and their suggestions, Wendy's eagerness to spruce up our kitchen, and a tiny bit of good old fashioned reciprocal Instagram peer pressure from Just Over the River, we decided to pursue IKEA butcher block counters as our upgraded kitchen counter top of choice. Though this change of counter surface wasn't even a blip on our DIY radar earlier in the year, once we started to look into the option we noticed just how affordable and "easy" of an upgrade it could be. But as I pointed out when we talked about our wine bar aspect of the project, the plain Jane square edge of the IKEA stock block left something to be desired in my opinion. Rather than leave the edge of the counter the stock rounded corner with square edge, we decided we could dress it up a little with a bit of wood working magic. We drew our inspiration from this photo that I found on Pinterest and sent to Wendy. Sure, that kitchen's counter top is probably a hulking 2"-3" thick at the edge, but you get the idea. The concept was hatched, I knew what had to be done, and I knew just how to do it. Here's a look at what we were starting with. Saw horses or cutting work surface. Due to the limited room to move in our basement, and to the weight of the counters, we opted to do our cutting in the area behind our house on saw horses. This made it much easier to get it into the house. The first and most critical step is the selection of the router bit you'd like to use for the edge. You can go with something more simple or fancy, it's up to you. Just keep in mind the thickness of the material you're working with. If you start using multiple bits and you only have 1 1/2" thick counters, the cut will be all routed area and no true edge, and this will look a little strange. In our case we wanted to maintain a true flat front, but give a nice edge above that front. 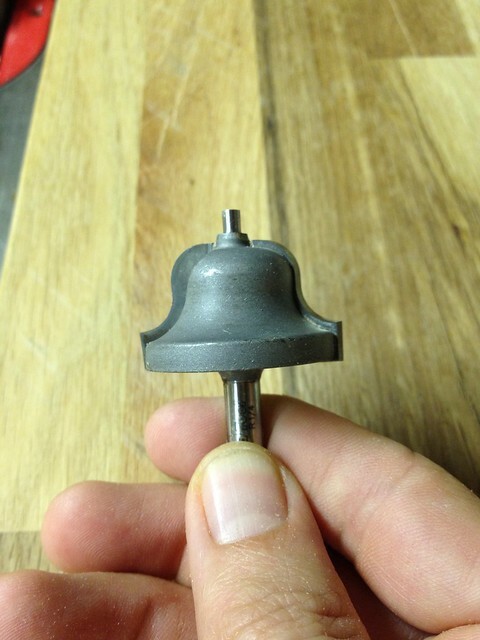 We chose an ogee bit that we already had on hand. With the bit selected, it's best to run a piece of scrap wood to get an idea of the depth of cut and what it will look like. But in the interest of full disclosure, I actually just started cutting the side of our long piece of counter, a little at a time, and then assessing after each cut. It's a bit more dangerous this way, but I figured I could just cut it off if I made a mistake, we had enough excess. The real key to cutting with a router is taking a little off at a time. When using a large bit to remove a lot of material, if you try to take it all in one pass you'll end up with a chewed up and ugly edge that shows lots of signs of burn. 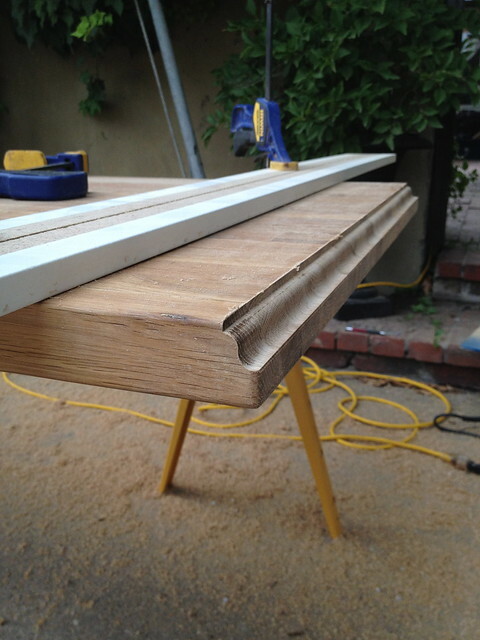 Instead, try not to remove more than 1/8"-3/16" of material with each pass. In our case, once I had the depth and final setting of the cut set, I used the straight edge board with minor adjustments each time to take a little bit of wood off with each pass. 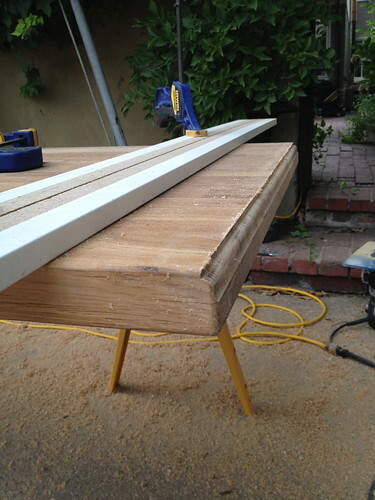 This reduces the likelihood of splintering and burn, especially when working with a really hard wood, like oak. If you've got all of your supplies, setup your workspace and give yourself plenty of room to work around your material. 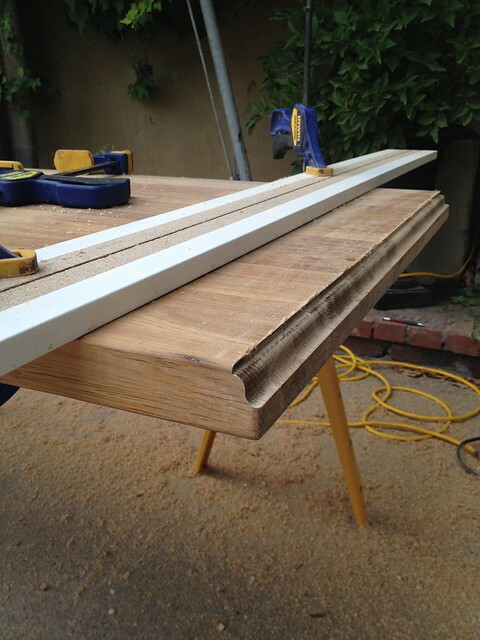 Next up, start making measurements on your counter tops for where you'll place your straight edge fence. In our case, we were using an aluminum guard on our router with a straight edge to it. This guard gave us 3 1/4" from the edge of the cutting bit to the edge of the guard. I also knew that we would ultimately want to have the router cut back 9/16" from the edge of the counter. So I made marks on the counter at: 3 1/4", 3 7/16", 3 5/8", 3 3/4", and 3 13/16". Note: Be sure to use pencil for these marks. I know this probably goes without saying, but using pen or something else will stain your butcher block. Pencil will easily sand away after you're all done. By using these lines to clamp my fence, this setup would allow me to take no more than 3/16" in any given pass. The final pass was reduced to just 1/16" to allow the router to take a bit less material and work a little less hard, giving a better final cut. But remember, these are my specific numbers for my specific setup. Your measurements will surely differ, but the 3/16" material removal rule of thumb applies for just about anyone. Using your many clamps, clamp your fence to the second set of lines (remember, the first line should be taking essentially no material). After running our router through on the first pass, you'll see just the slightest bit of material removed. Use this to ensure the line is straight and true to the edge. Any mistakes you can identify at this point will save you a whole lot of hassle down the road. Slide your fence back to the next set of lines. Remember, routers like to be used in a specific direction. I my case it's a left to right manner. Because of this, and the fact that you want to work counter clockwise around the surface, it's best to start with the left most edge you are planning to cut. After the second cut you should begin seeing just a little bit more of an edge. Again, check your work to be sure it looks the way you want it to look, and make any alignment corrections before moving on. The third cut will begin to really show you the edge you are developing. This is the second to last cut, so be sure to move through the cut at a consistent pace and without stopping. The final pass it meant to take off just a bit of remaining material and give you a nice and clean edge. It's extremely important to move consistently and without pause, not going too fast or too slow. If you linger too long, you end up with a blackened burn mark, too fast and you end up with splintering. You'll know the right speed if you just get a feel for your router. As you can see from my photo, I went a little too slow right at the beginning of the cut and left a bit of a darkened area. I ended up sanding that out before I placed the counter top, but it's much easier if you don't have to worry about sanding. The final step is just to lightly sand the edges to give it just a bit of an eased and word appearance. You aren't really sanding much at all, just taking the sharp edges off of the newly routed area. 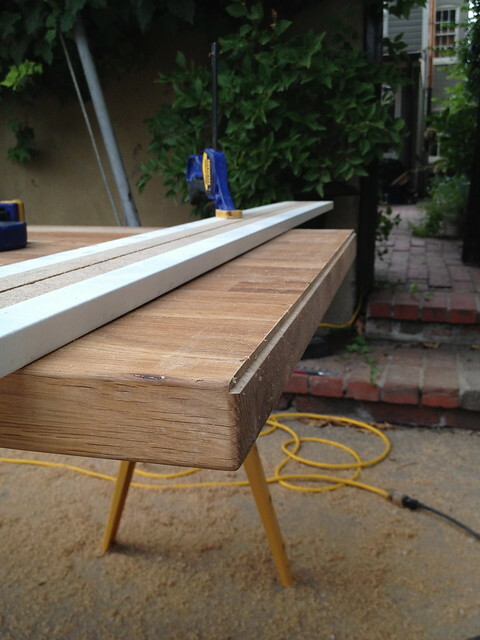 This light sanding will also take any fuzz off of the areas where you cut across the grain of the wood. After you've finished up the whole project, you can take a step back and look at your handiwork. 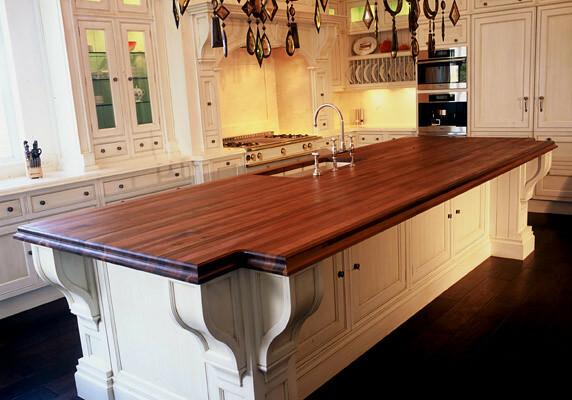 The whole thing should probably only take about an hour for setup and cutting, and you will have a long lasting upgrade to the standard butcher block counter tops that will let your project stand out. 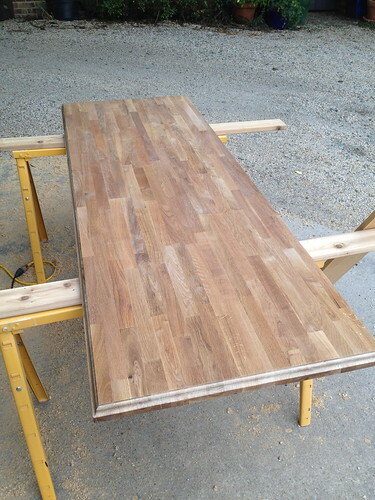 Here's a look at our wine bar counters, after completing the decorative edge. We consider the end result to be a success. In our opinion, adding this little detail makes the counters look more custom and expensive than stock IKEA butcher block. Better yet, the style fits far more with the aesthetic of our home. 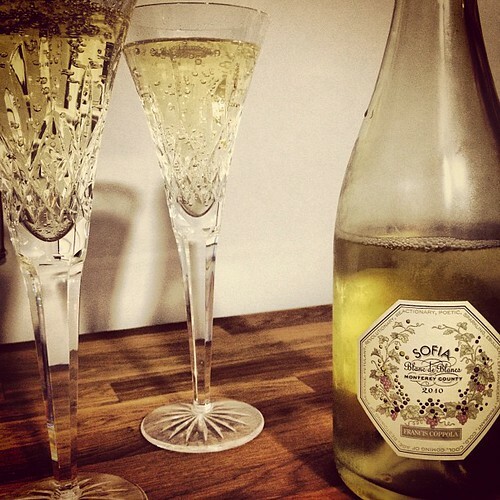 The last, very important step in this process is to celebrate your hard work! We've already begun enjoying our new wine bar area, complete with the new counters and upgraded details. 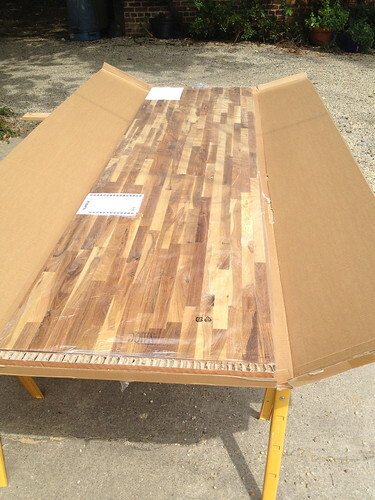 If you have a local carpenter or cabinet shop, there's a good chance they can do the same thing for you, but it might run you $100 or more, plus the pain and effort of transporting the butcher block. But honestly, where's the fun in hiring someone to do something when you can totally do it yourself? So what's your take on the new edge? Worth the extra time and effort and saw dust lined clothing to complete this upgrade, or would you have stuck to the tried and true straight edge? Have you been completing any IKEA hacks of your own? We'd love to hear what you've been up to. Intervention Fail: An Update on the Bag & Basement "Situation"
My husband is going to kill me when I inform him we must now do this to our already installed Ikea butcher block counters.... It'll totally work, right? It's the little details that really sings and complete the look, like a necklace with the little black dress. I would have never guessed the counter top came from Ikea, it looks custom made and a million bucks. Bravo! Thanks so much, Kate. I have to give Alex credit on this one. He was totally right about it giving the counters a much more polished look. It was a pretty time consuming step, but well worth it! Amazing. Makes it look so high end custom. Well done! If I ever did it, I'd totally have to take it to someone or I'd end up ruining the block. LOL. Really beautifully done! Wow that edge really made all the difference in the world. 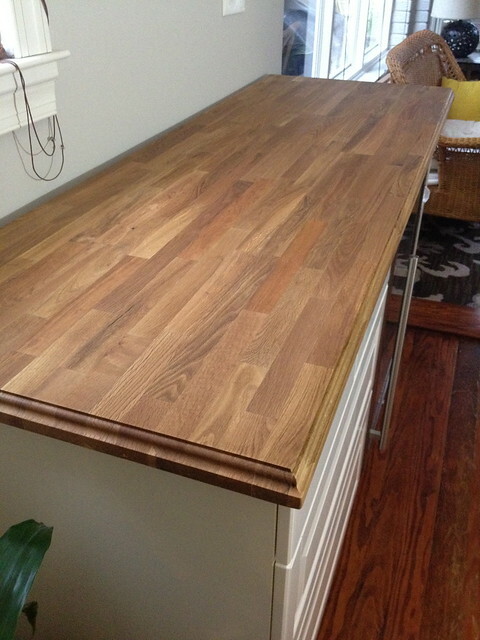 Crazy how something as simple as an edge on a countertop can completely transform it. 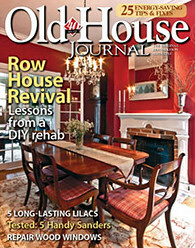 I'm about to transform an inherited ugly built-in in the dining room into something a little more classy. Hopefully my learning curve with the router doesn't take too long or I'll have alot of wasted product on my hands. I am curious what exact size ogee bit you used? 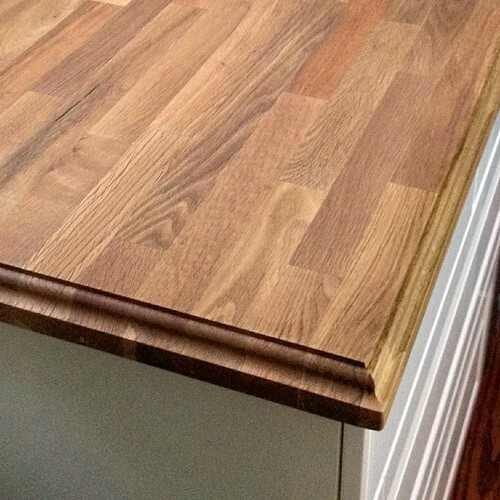 I am looking to do a similar treatment to my 1 1/2" wood counter and like the edge you ended up with. I am doing a 2" top and want similar sizing left on edge. 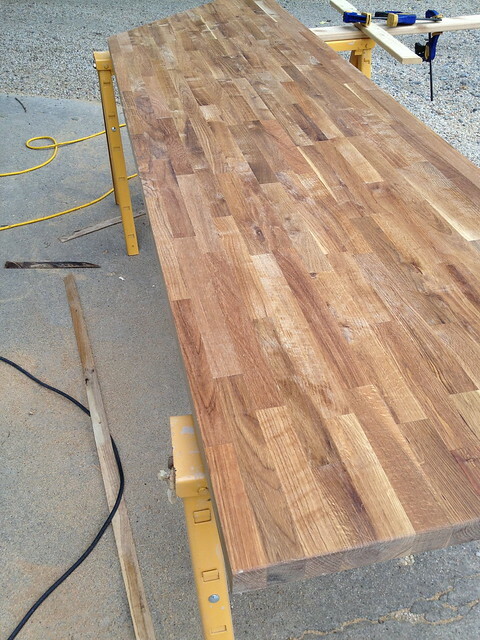 We've just sanded down our 25 year old oak butcher block countertop and island top. 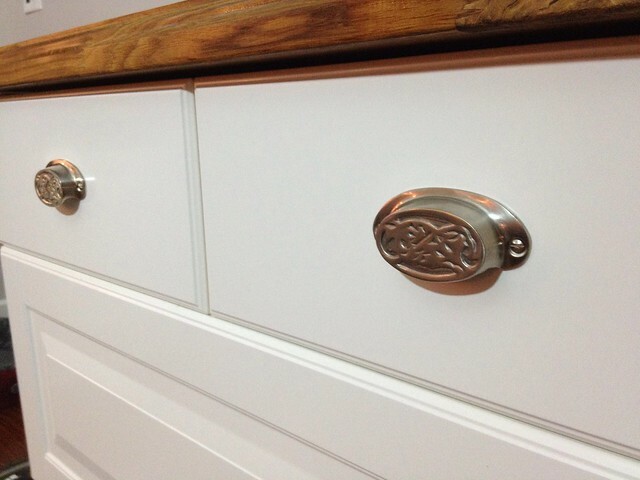 I had used mineral oil them but this did not prevent lots of water marks and stains. We now have nice non-marked tops. I was thinking of putting down one coat of Minwax Golden oak to bring out the grain, then a sealer, perhaps polycrylic or spar urethane(both clear satin), What kind of sealer did you use on yours to prevent rings? 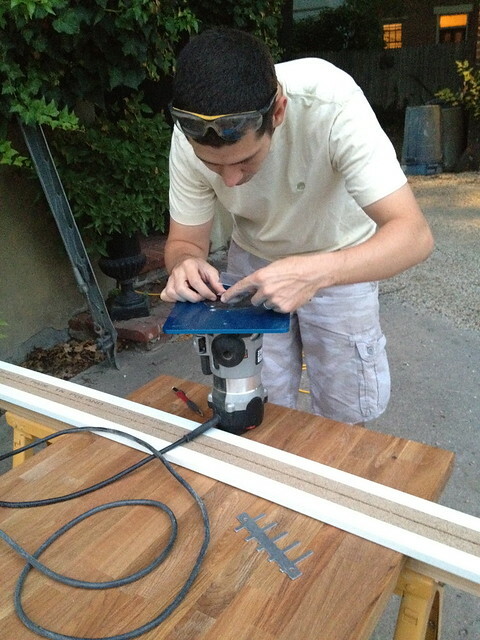 I should have mentioned that I DO NOT cut on any of my butcher block but always usu a glass or wooden cutting board.